A syringe pump is a device which can either infuse or withdraw liquid samples/fluids, at user defined flow rates and with selectable target volumes. Syringe pumps with simultaneous infusion and withdrawal with opposing syringes on a single drive, are also available. Syringe pumps are widely used in medical field as well as in laboratory and research fields. Applications of syringe pumps includes electro spinning, electro spraying, micro dialysis, dispensing/dilution, organ/tissue perfusion and fluid circulation. 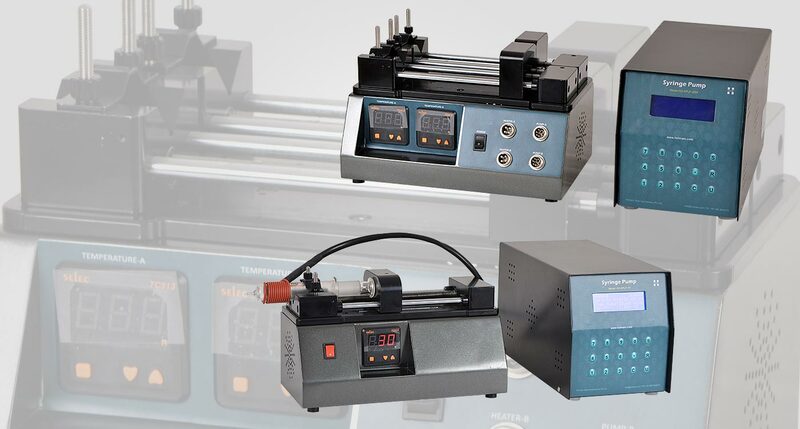 Syringe pumps are also useful in microfluidic applications, such as micro reactor design and testing, and in chemistry for slow incorporation of a fixed volume of fluid into a solution. Holmarc's SPLF series syringe pumps are versatile products ideal for precise dispensing of fluids in laboratory experiments, available at an economical price. 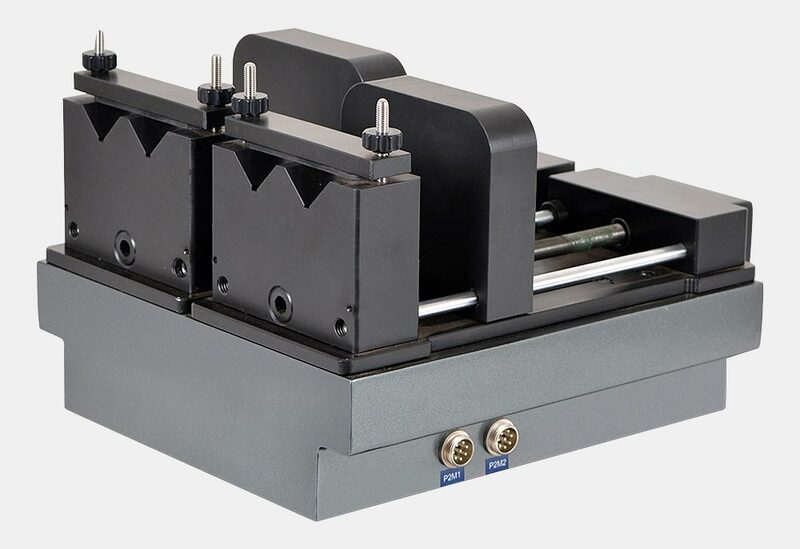 Our bench-top Syringe Pump has been designed for safe and ultra-smooth fluid flow for lab applications and can be easily set up inside a standard fume cupboard. Holmarc manufactures syringe pumps in various models for single syringes, two syringes, four syringes and ten syringes. These pumps can operate with standard off the shelf syringes in plastic, glass and stainless steel. The dispensing rates / flow rates possible with this device are very wide in range and can vary from 15.63μl/hr to 36.2ml/min, depending on the size of syringe used. The unit has built in electronics with keyboard and display for programming the operational attributes to work in standalone mode. This series of pump shows all the pertinent, real-time information on the LCD display. The Information displayed includes flow rate and total time remaining. Computer interfacing is also possible whenever required with RS 232C serial integrated into the control electronics of the system. This model supports dispensing as well as withdrawal. Powerful drive motors and innovative design have been combined with software control to deliver ultra-smooth and steady flow rates. Apart from all these, this device can be customized as per requirement. This model can accept two different size syringes which varies from 5 ml to 60 ml. Any type of syringes can be used in the unit including glass, plastic or stainless steel. This pump is ideal for more complex multi-step reactions and has multi-mode operation including infusion only or withdrawal only. A piston holder is provided in order to bring the piston back to home position. In our dual syringe model no: SPLF 2D, two syringes can operate independently with different flow parameters. This device can store up to 5 programs which can be reviewed or changed during operation. The front panel display allows the user to see all of the pump’s operating parameters to ensure proper operation during the experiments. Syringe size and flow rate are easily displayed, as well as the time remaining. In SPLF-H series pumps, temperature control of the syringe is possible. A glass syringe equipped with heating coil is provided along with this device. The temperature of the solution in the syringe is controllable up to 60°C from ambient. This heating option is available in various models with single syringe, two syringes, four syringes and ten syringes. * Actual diameter may vary depends on the syringe manufacturer. Manual micro syringe pump is a convenient instrument for controlled dispensing or withdrawal of fluids. It provides economical method for any application requiring injecting / withdrawing a calibrated volume under manual control. It can be employed in applications like chromatography, micro injections etc. Two models are available. One with graduated micrometer having 10micron resolution and the other with digital micrometer having one micron resolution. Digital micrometer provides convenient digital readings in microns. The resolution of the injection volume depends on the syringe used and resolution of micrometer. Syringe pump provided for Nano fiber electrospinning unit can withstand high voltages. This is possible due to the non conducting material used for its construction. They isolate the syringe pump inner electronic circuits from the high voltage external environment. Nano fiber electrospinning Syringe pump can withstand voltages as high as 30KV. Holmarc's SPLF-ES series syringe pumps are versatile and cost effective products for precise dispensing of fluids in laboratory experiments. The pump can operate with standard off the shelf syringes in plastic, glass and stainless steel. The dispensing rates / flow rates possible with the device are very wide in range and can vary from 2.8 micro-l/hr to 19ml/min. The unit has built in electronics with keyboard and display for programming the operational attributes to work in standalone mode. Computer interfacing is also possible when ever required with RS 232C serial in tegrated into the control electronics of the system. Holmarc manufactures syringe pumps in various models for single syringes, two syringes , four syringes and ten syringes as described in the chart below. In our dual syringe model no: SPLF-ES 2D, two syringes can operate independently with different flow parameters.